etm1109's review"Duoverb - Hidden Gem"
I consider myself more of a 70s guitar player in the sense I play a lot of styles like Rush, Led Zeppelin, Steely Dan, etc. So my comments about this product may not be as pertinent to people playing heavier music. I know this is an amplifier most people will love or hate. I wanted to approach a few features about this amp that I really like. Because the amplifier supports two amps at the same time, I have found a unique feature of the amp if you have a Line 6 pedal is the ability to switch between the two amps on the pedalboard itself. That means you can program each slot with two amps and flip between them. This really doubles the stored combinations of amps and allows you to toggle between a cleaner tone and a heavier tone for louder passages or leads. The other interesting thing I like is the output features. By plugging in a headphone, this turns off the speaker. With the XLR Balanced outputs, I can record directly to a console DAW and that is a nice touch. Regarding the sounds. Like a lot of people, I play a lot of styles and this is where this amp shines. Having the ability to get a nice early 60s Beatles tone or a heavy tone is great. I've played tube amps and owned them over the years and I also own a Peavey Classic 50 4/10. I really have compared the tonal quality of the Duoverb and the Peavey and I find the Duoverb holds it's own with the Classic 50 though I would agree there are some tones the Peavey seems to nail a little better at louder volumes. Being the Peavey has 4-10s and I use a lot of hollow/semi-hollow body guitars, I believe the cabinet and tube is responsible for that. Overall, for $200 this is a great amp even for beginners and has some interesting features that shouldn't be overlooked. If it broke or were stolen, I'd get another one. If I win the lottery, I'd probably buy a couple of backups. I also own the Flex III which is nice, but having the ability to mix two amps does present a lot of interesting tones one doesn't usually find in an amplifier. Line 6 is really well known for their amp modeling features with their pod units but as well as their actual combo amplifiers. This is one of the first line 6 modeling amplifiers that they put inside of a combo. Basically you have this combo amplifier with 16 and models to choose from. It allows you to program four programmable amp channels to select from on the fly. It's basically 100 W stereo amplifier that is including a foot switch as well. The tone of this amplifier is not very good. It sounds very fake processed and unnatural. When this amplifier was put out it was one of the first modeling amplifiers be put into the combo. So therefore the modeling industry was not where it is today with what line 6 is been able to accomplish and many other of him modeling technologies. The tone of this is not a very good tone and you probably wouldn't use it in any professional recording . It's not a sound that you're going on fall in love with if you've ever played a modeling amplifier, you can really tell that all it is doing is mimicking what notes are being played. It has no dynamics and the tone or the feel of the amplifier is missing. It doesn't feel natural whatsoever and overall is not a very fun or pleasing amplifier. These amps have been discontinued for quite some time now. It only way you can find this is only used market and I would not suggest going with this amplifier. This is very old technology especially since it's a computer-based amplifier and technology has advanced quite some since this amplifier has been put out. I suggest going with one of the line 6 near models with the newer technology involved. heads on fire's review"Great backup amp for the price." The Line 6 Duoverb is a fantastic steal right now. When it came out, it was a pretty innovative amp, with good tones and features, but modeling technologies have made giant leaps since 2002. New challengers, such as Fractal Audio, are now making waves in the modeling amp world, but the Duoverb was quite cool when it was initially released. Now, with the prices they are selling at on the used market ($150-200), they are well worth it, and they will blow away any other solid state amp of this size and price range. The looks help, as it has the appearance of a nice vintage piece, rather than some cheesy 14-year-old's favorite metal star's signature practice amp. Other amps from Line 6 feature effects like delays and chorusing, and this amp does not. That's not necessarily a bad thing - sometimes a nice, simple amp is the way to go. It basically offers reverb, 16 different models, and the ability to run 2 different models at once. For a simple amp, it sure packs a lot of heat, and the tonal variety is wonderful. Sparkly cleans, boutique overdrives, and saturated metal nirvana all reside within, making this a great amp for any genre. I'm a fan of this amp, especially for the price. 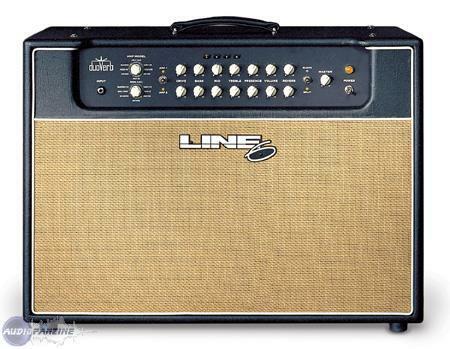 This would make anyone a great amp that can be used in practice, on gigs, or in the bedroom. Any touring musician needs a backup amp if they can fit it in the van, and the price makes this a very attractive option. Recommended. MGR/MOUMOU's review"Line 6 Duoverb 2x12 Combo"
having all these amps at a flick of a finger is a big advantage if you are creative. i like the VOX AC-30 model my favorite very very warm vintage sound, the plexi lead is also sharp with some metal zone boss distortion pedal. just these two models are around 3000$ at least. what i like the most is that you can create your own sound by mixing two amp models but it take alot of time. i'm not going to use all the amp models of course but i have them if needed. to make it clear and not confuse everybody, i'm fully satisfied with this amp. however i red some comments stating that this amp is nothing but a cardboard sound. alot of people did not understand this amp because it offers many features. and if you expect the amp to give you automatically a perfect sound that you like without any effort, you might expect the amp to strum your guitar instead of your fingers also. every amp model has its own setting otherwise you just bought a line 6 duoverb cardboard simulator. with 2 12" celstion speakers it is loud. no need for extention cabs. the quality of the amps are accurate. i don't care about the look if it is nice or not because it is not a crucial parameter. i have the sound that i wanted. if you are lazy rocker this is not your amp. go get the amp model that you want and do not bother because the line 6 duoverb will drive you nuts in couple weeks. if you want to be unique this is your amp. MGR/Guitarman76's review"Line 6 Duoverb 2x12 Combo"
Bought this amp in Seattle from a former Line 6 rep after hearing about it. I have no complaints whatsoever. 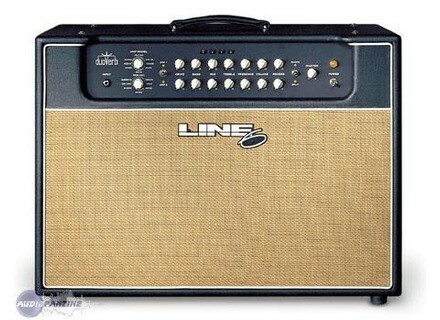 Line 6 nailed the amp models with this one. Great tone, easy to use controls. A great bare-bones amp for the guy who likes to keep it simple, yet have the power to totally change his amp sound at his fingertips without much tweaking. I like the ease of use features, the amp models are as close as you can get, being able to combine two amps at once or split them between cabs, nice looking cabinet, incredible sound. Needs casters but thats it. Line 6 Duoverb combo is definately a great addition to any guitarists collection. The amp models are accurate, its tone is incredible, and you can get tone at any volume. Its also plenty loud and you can run an extension cab with it to really shake up your neighborhood! The manual is very nice. There are pictures of the amps modeled, a small anecdote and "classic" settings that have brought fame each. This amp is very easy to use. I am not at all the type to spend hours manipulating 36 buttons in all directions, and I quickly got a great sound. What I loved with this amp is the emulation output HPs. It allowed me to be reassured as to his coming out in front when I was playing on big stages. The emulation output has a very broad spectrum but lacks a bit of momentum. Supplemented by a microphone in front of an HP, it brought joy to my ears and those of sound engineers who could not get an amp emulation could sound like this. In the studio, it allowed me to stay on the settings that I knew perfectly while benefiting from the flexibility of the HP emulation output. The eternal debate about modeling amps ... realistic or not? So it depends on what you mean by realistic. Let me explain. When I bought this amp I had a Marshall JCM 900 with a baffle with 4 vintage 30 in which I plugged in a Les Paul Custom ... well, big sound. And basically its Duoverb done very well job. In the blind test, difficult to tell the difference with a real tube amp. Mixed with the sounds of other instruments, it becomes a challenge. on the other hand, if the crunch sound or the sound of each of the amps modeled one approaches ... it's something else. Because if this amp works very well by mixing the sounds of two amps, it does not compare with an original amp ... and we must admit that the modeled amps are all the same, a little cartoonish. I played this amp for over 5 years. I went on tour "am I doing everything in the truck just as I can, even if it means Tetris with the gear" and I must admit he never flinched while the "all-tube" made of other guitarists the soul. But what do you with the experience was the most sensitive finer ears, it is in the subtle! So what? Well, now I do not play on all-tube amps and handwired ... but flip side, I have one currently under repair. Looking back, in addition to many services, this amp has helped me to know what amp I liked and that's huge! sylbenima2's review (This content has been automatically translated from French)" Very good amp transistors"
- 100 watt combo models. Very powerful. - Basically, this is the preamps Vetta without effects. - Effects (still): wah and reverb. - Fully stereo amplifier. Independent settings right and left. Very helpful and the amp sounds even better when the sources are mixed. - For each channel there are two times the following settings (right and left): Amp, drive, trble, mid, bass, presence, vol, reverb + master general flight. - Comprehensive Connectivity: Stereo loop series (inputs and outputs), 2 XLR outputs (true stereo I tell you) switch with ground / lift, midi in / out / thru, RJ45 socket for Line6 pedals that I never used (I work at noon). - Simulation hp also I use some. Setup is simple, even if the settings are numerous. Basically, it works like all the amps we known since forever, but in stereo. Quickly the sound is desired is obtained. Very good manual that details the amp models. Very good MIDI menu. The sounds of Duoverb are very good, much better than any other amp brand. Include input sounds emulated amps. But it is especially a good amp that meets the sound of the guitar. The clean sounds have a great dynamic and distos are singing. The amp is excellent on crunches and distos blues, rock or fusion, perhaps less convincing for metal, but cash fine pedals. Here's a perfect amp (that's more than 10 I played it), powerful, warm and extensive connectivity. The great advantage of Duoverb is that it provides a wide range of sounds managed by an excellent preamp, and manage it all by noon, all served by two discs flawlessly.